One person in this world that I truly admire is my good buddy, Anny. Not only was Anny the recent recipient of a double lung transplant due to her cystic fibrosis (She's doing marvelously well! ), but she also gave up her two miniature poodles, so they could have a better life. Wait... what do I mean? Let me explain. 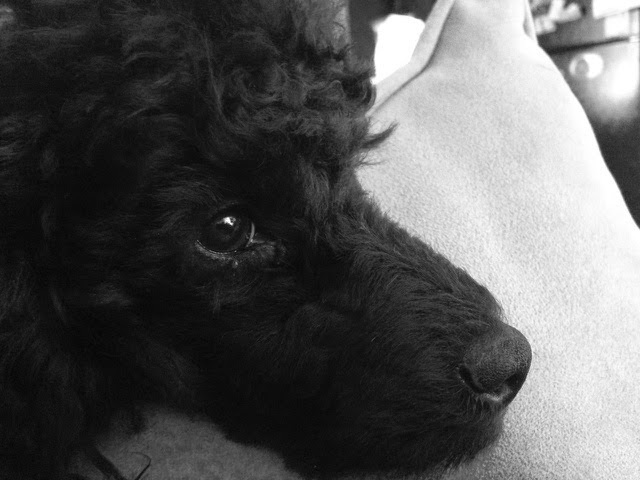 This past spring, Anny decided to adopt two adorable miniature poodle brothers, naming them Benny and Boomer. Like any new dog mom, Anny immediately fell in love with them, and they became her little family. The downside was that as much as Anny doted on them, there was no getting around the fact that she had to leave them, crated, every single day while she went to work. Anny's dad did drop by mid-day to let the little guys out, but that is still an awfully long time to be all alone. A lot of people who have pets, though, think this is perfectly fine, and they try to convince you that their critters just sleep the day away while being stuck in their cage. Anny can pick up her two at once! I can hardly lift one dog, the Milt Dog, on my own! Why was this visit our first and only? Well, when I called again to stop by for a play date, Anny confided to me that she gave the puppies to her sister and nieces so that they could have a better life not subjected to the daily rigors of a nine to five job. Anny, of course, would share "joint custody," but for the bulk of the time, the pups would be in the care of someone who could provide them with more entertainment throughout the long work days. When I first heard this decision, I was a bit disappointed, but, ultimately, I really, really admired the strength it took for Anny to realize that her pups, despite how much she originally wanted them and currently loved them, were just not receiving the very best quality of life. Many people, in Anny's very similar position, would continue to muddle along with their choice to adopt, but Anny made a tough decision that was responsible and selfless. As much as I love my Milt Dog, I hope that I would make a similarly wise decision if I ever had to.